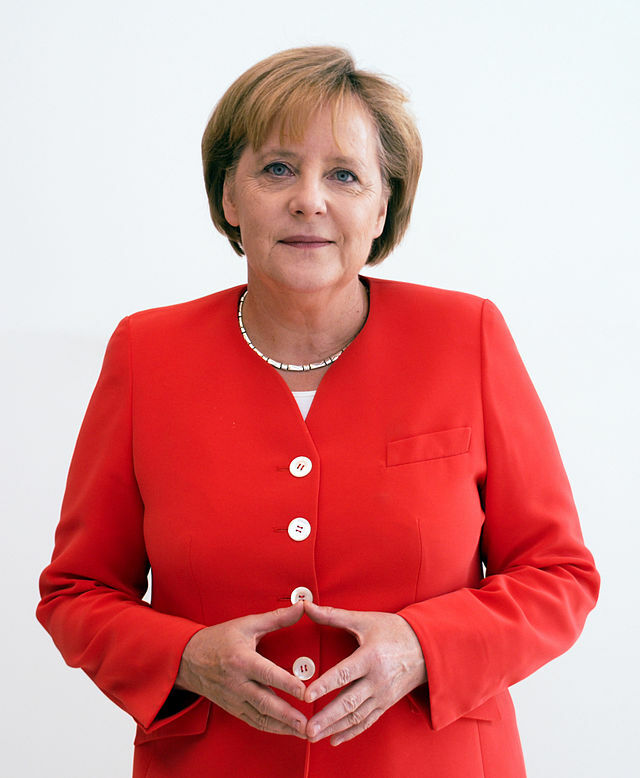 Angela Merkel, Germany’s Kanzlerin or she-chancelllor, is indisputably the most powerful woman in the world. And yet she seems so wildly unlike most politicians – where are the flashy smile, the clotheshorse spouse, the sharp suit, the soundbite? Yes, where are Silvio Berlusconi, Nicolas Sarkozy, Jose Luis Zapatero, Tony Blair, Gordon Brown…? Sacked by the electorate. Every other European leader has been replaced since the banking crisis started in 2007; only Angela Merkel, the “grey mouse” from East Germany, has not just survived but thrived in these tough times. Clearly, her appeal to (at least half of) the German electorate is profound. And actually, it’s not hard to see why. She’s led that country through the incredibly tricky economic swamp that is Europe post credit crunch. She has been prudent, restrained, courteous – imagine having to deal with Berlusconi at some of those meetings. She has taken her time making decisions that have turned out to be right for Germany. Not only that she appears to believe that leading a country is a form of public service, that power should be wielded for the public good. When it came to it, she wasn’t afraid to do a U-turn on nuclear power, axing the entire programme and steering Germany towards massive investment in alternative energy sources after Fukushima. She is future oriented, not, like so many politicians, because of her personal “legacy”, but because she takes the long view for her country. The two stand-out features of Merkel’s chart are the stellium in Cancer, the sign of the mother, so appropriate for a politician known as Mutti, and the planet of mass projection, Neptune, on the Midheaven. Cancer is one of the political signs – along with Capricorn and Libra. Cancer is not only about mother love, but about the love of one’s nation. Germany has been good to Merkel. She was born in East Germany, under repressive communist rule, and spent her life until her mid-30s in obscurity, working as a chemist and avoiding too much politics. Then in 1989, the Wall came down and Germany was united. It wasn’t long before the new Germany clasped Merkel to its bosom, and she began to climb the political ladder. It seems incredible to think now, when you look at the powerful senior politician, that Chancellor Kohl referred to Merkel rather condescendingly as his Mädchen, his girl. Angela Merkel’s natal chart the Sun-Uranus conjunction is key to understanding her character. Of course she’s not like other politicians, she’s Uranian for goodness sake — a rebel, an alien, unique. Uranus acts like a time machine especially when it conjuncts one of the Lights. We have seen this before in the charts of all writers of historical novels — and Meryl Streep, who is a few years older than Merkel, also has this signature in her chart in Cancer. But of course Uranus is traditionally associated with futurism, with new technology, with looking forwards. In the case of Angela Merkel gives her intense understanding of her place in history and ability to the both feel Germany’s past and imagine forwards into the future. Because it the conjunction is in Cancer this is an emotional knowing. Jupiter’s involvement gives her a huge view of history, and expands her optimism about the future as well. And it is partly this optimism which gives a clue to Merkel’s success. She believes in the future Germany. Jupiter gives us faith. This Uranus is further emphasised because it is in mutual reception with the moon in Aquarius. The Moon rules Cancer, and Uranus rules Aquarius. Moon in Aquarius truly is a humanitarian placement. It does give a coolness to the character but that’s probably pretty useful for a politician. This moon in Aquarius is absolutely key to her success. Cancer is the most irrational side and without the Aquarius Moon, Merkel might be overwhelmed by emotion and feeling. However the ruler of cancer is in the most rational sign. She is able to analyse and dissect her own feelings.Furthermore that moon neatlytrines Neptune On themidheaven. She has an instinct for the public mood. You can see that it is also opposite Pluto, the planet of transformation, in the house of psychology. I suspect quite simply Angela Merkel is a very good psychologist. And further and she’s not afraid to confront the dark side. It’s interesting that Moon opposite Pluto is across the money houses — my money versus your money, with Venus also in the 8th house of other people’s money. Will she eventually make the Plutocrats pay — as she promised all those years ago? Or will European taxpayers continue to foot the bill for, well, everything? Merkel is clearly a political operator. Just look at that Saturn in Scorpio in the 10th house of public life. Saturn in Scorpio can be a brilliant strategist. Saturn is terribly practical. Scorpio is the sign of the grand vizier, the eminence grise. You might think this would make Merkel an unlikely leader, surely she ought to be the power behind the throne not the queen herself. But her powerful political strategizing is hidden behind a Neptunian smokescreen. And Saturn that high in the chart is vauntingly ambitious. No wonder Her predecessor underestimated her. Neptune is also in a close square to Merkel’s Sun-Uranus conjunction. It suggests the politician that we see in partnerships across Europe and even around the globe is not the real Angela Merkel at all. It won’t be that she keeps her private self completely hidden but simply that she is easier to see on a one-to-one encounter. The stellium in Cancer — Mercury, Jupiter, Uranus and the Sun also suggests a highly intelligent and complex individual, possibly with a tremendous memory for detail (Mercury) as well as an ability to see the big picture (Jupiter). The disciplined thinking comes from the trine aspect between Saturn in Scorpio and Mercury in Cancer. It looks like Angela Merkel’s faith has been sorely tested in the past few years. First her Mercury then herJupiter, both in cancer, are under pressure from the ongoing Uranus-Pluto Square. Although we have seen the cool calm Libra MC and the Sagittarian optimist, she must have been going through some dark nights. Yet at the same time she won an unprecedented third term as chancellor, consolidating her power. And with her ascendant in Sagittarius she is flexible when it comes to partnerships, and it’s this which has kept her in power so long.. It will be interesting to see what transpires after the final square between these two mighty planets which directly hits Merkel’s North node, her destiny point. This is in her first house and in Capricorn the sign of ambition, status, earthly power. She truly has followed this destiny which pulled her away from the soft comfort of partnership where she might’ve stayed with her Sun, writing science-fiction novel perhaps and quaffing beer. Is it possible for her to become more powerful? Or will she be forced to transform her destiny completely? 2015 promises to be quite a turning point for Germany’s She-chancellor. She is a hero of mine. She was daughter of an East German pastor – you can imagine the compromises and challenges that must have been in such a repressively secular state pre-1989. You stress her future thinking nature. What would indicate her very interesting past, Christina? Good question since she wears her pasr as abadge of honour — almost literally in a way. One place you can see her past is that IC in Aries ruled by Mars in the first house. So there’s a combinatuion of bravery — as exemplified by her parents in a police state, and religion. This is all about being true to your beliefs. Then I thonk we also need to look at the Moon — her inner child, a wise child — and involved, as was shown, with Uranus. Moon in Aquarius does often simply show an unusual childhood. My wrist is preventing from replying as fully as I’d like. But you can also tell by looking at AM’s natal chart that she is moving towards her power. Quite often people with 7th/8th house suns don’t move forward until the Sun has progressed by House or sign. When the wall fell, Merkel’s Sun had progressed to 0 Virgo — it had changed sing for the forst time in 30 years — momentous. She was ready to come out into the world. Look at the signs that rule that pluto-moon axes. Leo and Aquarius – intercepted. Pluto in Leo is a generational influence, and aquarius is about networking and trends. While both planets are intercepted, you can easely see that she was somehow “separated” from her generation while growing up. Was not able to “shine” in a group. And while sun-uranus is a very powerfull conjunction, neither sun, nor uranus is in rulership. They are actually lacking playground for their otherwise powerfull energies. (I suppose, her sun progress trough leo was a very hard time.) 5th house and 11th house are empty, the ruler of 11th (pluto) in the intercepted sign and in the house of death and transformation along with the ruler of 5th… It doesn’t sound like joy, fun and friends. Definitely, there are some issues about self-expression and group-expression. So, she use knowledge, information and religion (gemini-saghittarius) to compensate what is lacking: intuition. Oh, I forgot: Uranus is combusted. 🙂 So it’s similar to uranus in leo, where it’s in detriment. There are some very good intentions, but ego-busted, lacking objectivity. While I do support many of her reforms, it’s odd: Talking for years about how usefull nuclear power is, and then changing the direction over night. “Trend is what I decide” – combusted uranus. well said Eleonora, well said ! Uranus combusted: 🙁 ego busted, lacking objectivity. What bothers me yesterday what I said ? ; Trend is what I decide. I also see her Sun-Uranus in Cancer as describing the divided homeland she grew up in. Now, all these years later, she has found herself working to prevent her larger homeland, the EU, from splitting apart. Nice point & it fits in with the U-Plu square threatening her faith. i like the hand gesture – I can see the womb in it. Feminine strength, Germany’s mother ! Hi – can you ref, the link to Uranus as the ‘time machine’ and historical novels please? Thanks. I am very intrigued by the astrology of color. So you think red is a natural power for merkel as a Mars rising (Aries)? Dear Blue — yes, but let’s investigate. AM was born in West not East Germany at the time she was born. just for clarification. Good point. Her family moved there the year she was born.